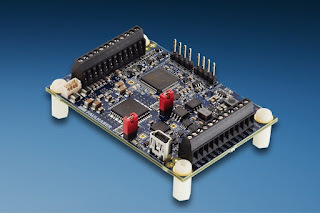 Searching the multitude of available programmable motion controllers for one that is ideal for micro stepper motors with phase currents of sometimes less than 100 mA was once a real challenge. The new MCST 3601 series, developed from the cooperation between FAULHABER and Trinamic GmbH (the motion controller specialist for stepper motors), offers the solution. 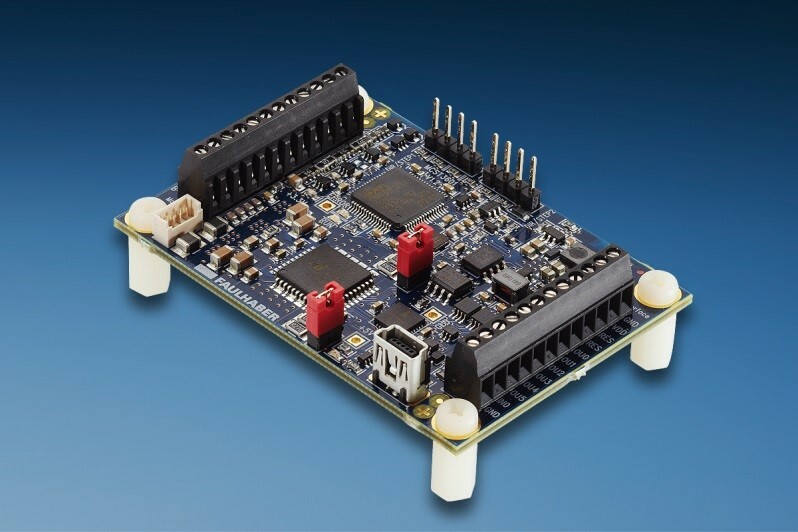 This controller is compact and flexible, and is suited to fit perfectly with the full range of FAULHABER micro stepper motors. The series, which is equipped with a micro controller and a driver, can precisely regulate phase currents from 10 mA to 1.1 A. At the same time, it can be operated with a supply voltage that can vary between 9 and 36 VDC. Thanks to simple and fast communication with a PC via USB 2.0, all types of movements can be programmed using the available software. The ten inputs and outputs also allow external variables to be taken into consideration. Since the controller is designed as a test electronics system, users can adopt the predefined architecture according to their requirements and integrate the components in the platform of their specific industrial application. Furthermore, the MCST 3601 series can actuate stepper motors in micro stepping mode. In this operating mode, up to 256 micro steps can be programmed per full step. This allows the resolution of the controlled rotary or linear movement to be increased considerably and/or the vibrations caused by the motor to be reduced. This capability is an excellent fit for optics applications where resolutions are often in the micro meter range. Please contact the MICROMO Team for more information. DDP is the business development event bringing you visionary ideas, disruptive technology, and partneringONE. Join us January 20-22 in Palm Beach Gardens, FL as business development executives from over 150 companies including; Pfizer, Merck, Johnson & Johnson, Amgen, AbbVie and many more, will all be at Drug Delivery Partnerships with one primary goal: to enter strategic alliances. PartneringONE is now open – with more dedicated hours than ever before to jump start your next deal; Search for partners, customers or clients. Request meetings. Accept or decline requests from others. Arrive on site and meet. Learn more here. Register now and save $200, use the code XP2178BLOG – click here to save. Information technology for drug delivery telemanagement and the business of Pharma are also becoming inextricably interwoven, with medical technology, or medtech, taking the industry well beyond NDA approvals and filling scripts. As if drug development and delivery were not already sufficiently complicated, new combination products and telemanaged combination products make the processes even more so. Within and around Pharma there are many stakeholders who can partner to make drug delivery telemanagement a success. Some of these may not have always been obvious. These stakeholders / potential partners have a wide range of interests and include a wide range of people and organizations. Many entities and individuals are stakeholders in multiple categories – sometimes they can even be perceived or actual adversaries. IT, EHR, component and service suppliers, including consultants, associations and conference organizers focused on healthcare in general, such as AARP, or on treating patients with a specific disease; or on advancing drug delivery telemanagement, such as Parenteral Drug Association, American Telemedicine Association, HIMSS/mHIMSS, P4HA, and Drug Delivery Partnerships. As a member of the expert speaking faculty at the upcoming Drug Delivery Partnerships event taking place January 20-22, 2016 in Palm Beach Gardens, FL, Bob Nissen, President, Nissen Consulting Group, LLC sat down with the DDP team for this exclusive Q&A style interview. Want to learn more? Download the complete agenda now. 1. Has the Drug Delivery Ecosystem evolved? What does it look like today? I can only comment relative to the Over the Counter (OTC) pharma business- which represents $119 billion in worldwide annual sales, and $29.5 billion in U. S. annual sales according to the Nicholas Hall 2014 DB6 database. Oral drug delivery is the vast majority of the business in the U. S., with more than 80%; topical products (dermatology) and nasal delivery represent the most of the remainder of the business. Medical devices are a very small portion of the OTC business. Injectables are not relevant among OTC's- they are utilized for pharma products and animal health. Although there is a shift toward new forms among oral OTC's- long acting medicines, better tasting forms (gummies, drinks, chewables- especially among vitamins and supplements), and traditional tablets are still a large part of the OTC business. 2. What is the next big thing in Drug Delivery as we move into 2016? In the OTC space, we see a continued development of better tasting forms, although this will be regulated as it relates to certain OTC categories where overuse can be harmful to consumers. Intellectual Property (IP) will be crucial to new brand introductions and brand extensions, as novel items will be promoted more aggressively. Medical devices may continue to be more of a part of the OTC landscape (e. g. Icy Hot, primarily a topical pain reliever, introduced a tems device for pain relief in late 2014). 3. What are some of the newest and most evolving technologies you have your eyes on? And what’s next in connectivity? Over time, OTC's usage, especially in important maintenance areas (e. g. low dose aspirin and its daily use for heart healthy benefits) will be tracked on smart phones and other devices frequently followed by consumers. Apps and reminder messages will also likely evolve more and more as it relates to OTC usage of maintenance items (vitamins, fiber supplements, probiotics, etc. ), as well as items crucial to their well being. 4. When do you start to look at utilizing drug delivery systems? DD systems are evaluated for OTC's in advance of a new product launch, when considering brand extensions, as lifecycle management additions for Rx to OTC switches, and as a way to appeal to new users or improve compliance for existing OTC products. The incorporation of new forms within OTC's can sometimes be done quickly (1-2 years prior to launch), especially in light of the monograph and DSHEA regulatory approval routes. However, in the case of NDA's,( e. g. sustained release orals, dermatology products with enhanced penetration capabilities, etc. ), the planning in advance of launch can sometimes be five years or more. 5. What are your thoughts on how innovation is going to be pressured as a result of changes in the site of care? OTC's will continue to benefit from increased self selection and more products switching from prescription to OTC. Innovation needs to focus on changing trends in the home and workplace, the aging and more active population, and greater use of self care, especially maintenance self care to insure a more healthy and improved lifestyle. This Friday, November 13th is your LAST CHANCE to save up to $700 on DDP 2016! Use the code XP2178BLOG to save - Register now. If you're planning on making it to beautiful Palm Beach Gardens this January to join us, be sure to pocket those savings while you can. By the way, did you know about all the new formats at DDP this year? Your conference experience should include more than lectures. Trade in the slides to speak off-the-cuff with your peers to openly discuss pressing topics and have intimate conversations! Download the brochure to find out more. The EpiPen was the groundbreaking civilian auto injector. It is still a notably successful product. There were many barriers to its introduction and eventual success (see recent articles in Fortune and Businessweek). Many are the same barriers for smart medication telemanagement–which can be overcome by using some of the same strategies and tactics that resulted in the EpiPen's success. Biotech and specialty pharma (often costly, injectable, sensitive products) are the great hope for a better life for many patients. These products are also a focus of many healthcare stakeholders. There are parallels with the EpiPen. Smart medication telemanagement systems allow patients to improve outcomes and provide great value for all stakeholders. Implementing telemedicine technologies in smart medication telemanagement is especially critical and parenteral product stakeholders have incentives to lead in the efforts. Despite the fact that there was a known opportunity, there was a perception that EpiPen was just another new complicated thing. Similarly, some still find the concept of providing smart medication management too new. Some want to concentrate only on the same old initiatives used for years. Many of those don't work well in t he changing healthcare environment. Arguably, smart medication telemanagement can help solve many current and coming problems. Some barriers, issues and threats, as well as observations on possibilities to deal with or overcome them are discussed in this poster to be presented at a session during The Universe of Pre-filled Syringes & Injection Devices conference being held November 3-4, 2015. 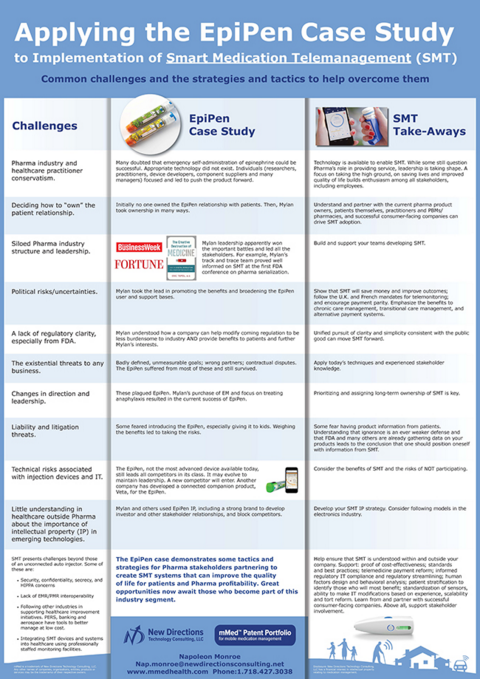 The EpiPen case demonstrates some tactics and strategies for Pharma stakeholders partnering to create SMT systems that can improve the quality of life for patients and Pharma profitability. Great opportunities now await those who become part of this industry segment. New Directions Technology Consulting Managing Director Napoleon Monroe has an extensive background in developing and producing pharmaceutical delivery systems. His experience also includes managing a Fortune 500 private brand and building/managing the IP portfolio for a company that is now part of Pfizer. His areas of expertise cover product development, manufacturing, licensing, regulatory processes, risk management and international marketing He has experience managing business relationships in more than 30 countries. Mr. Monroe spent more than two decades at Survival Technology (now a part of Pfizer), where, as a corporate vice president, he was responsible for product development and systems strategy. While there, he led teams that invented, patented and commercialized drug delivery devices, such as the EpiPen, the Antidote Treatment Nerve Agent Auto-Injector delivery system (which still protects U.S. and allied military and civilian personnel), and a number of telemedicine devices. Mr. Monroe is the sole inventor of the patents in the mMed portfolio. mMed is a trademark of New Directions Technology Consulting, LLC. Any other names of companies, organizations, entities, products or services may be the trademarks of their respective owners. How many partneringONE hours at DDP 2016? SEARCH. REQUEST. MEET. We understand how vital partnering is to your business, so this year at Drug Delivery Partnerships, taking place January 20-22 in Palm Beach Gardens FL, we added more hours dedicated for partneringONE than ever before! With partneringONE, you can search for partners, customers or clients. Request meetings. Accept or decline requests from others. Arrive on site and meet. Don't forget, your DDP registration includes access to partneringONE. If you register by 11/13, you will save $600 so act now!